How to have a healthy pregnancy—without meat. Eating well during pregnancy is a given. But that doesn't mean you have to ditch your vegetarian or vegan diet. Medical experts, including the American College of Obstetricians and Gynecologists and the Academy of Nutrition and Dietetics, have given you the green light to continue your current way of eating. A vegetarian (meat-free) or vegan (no animal products) diet can help prevent obesity and decrease the risk of chronic illnesses, including heart disease, cancer and diabetes. It's also more Earth-friendly than the typical American carnivore's diet. "You can have a healthy pregnancy on such a diet," says Dawn Jackson Blatner, R.D., who sees pregnant vegetarians in her private practice. "You just have to do some planning to ensure you are getting everything you and your baby need." In addition to taking a high-quality prenatal vitamin, here's how you can make up for any nutritional weak links if you do decide to stay meat-free during your pregnancy. This nutrient is vital for cell growth and development—yours as well as your developing baby's—and you need about 71 grams every day right now. Beans can provide much of what you need. "Beans are the magic bullet for vegetarians and vegans," says Blatner, who is also the author of The Flexitarian Diet (McGraw-Hill). "Along with lots of protein, beans provide iron and zinc." Zinc is also necessary for cell growth and normal fetal development. To get the protein you need, simply replace animal products with any type of beans; in recipes, substitute ¼ cup of beans (any variety) for every 1 ounce of meat. A mom-to-be bonus? 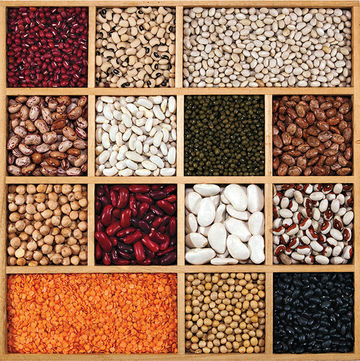 Beans are high in protein—and low in calories: 1 cup of soybeans has 298 calories and 29 grams of protein; 1 cup of lentils has 226 calories and 18 grams of protein; and 1 cup of firm tofu has 176 calories and 20 grams of protein—just keep in mind that experts advise choosing whole soybean foods (such as tempeh and tofu) instead of soy protein isolates (faux meats, shakes and bars). Nuts are also rich sources of protein (and healthy fats), as are low-fat dairy foods—milk, yogurt and cheese. But don't rely too heavily on cheese or faux burgers to replace meat in your diet; veggie "meats" are usually laden with sodium, and cheese is very high in saturated fat. This mineral, which helps red blood cells deliver oxygen to the fetus, also protects you from anemia, a common problem during pregnancy. According to Blatner, pregnant vegetarians and vegans need as much as 50 milligrams of iron daily. Besides beans, other vegetarian iron sources include raisins, iron-fortified cereals, prune juice, blackstrap molasses and spinach. Also, switch to sprouted grains. "Sprouting decreases the compounds that make it more difficult for your body to absorb iron," Blatner explains. To help your body absorb iron, eat vitamin-C rich foods, such as red peppers, citrus fruits, dark leafy greens and strawberries. This vitamin, which is required for proper red blood cell formation and neurological function, is most abundant in animal products. Though there are a few nonmeat sources of B12 (fortified breakfast cereals, for example), the Academy of Nutrition and Dietetics recommends that both vegans and lacto-ovo vegetarians (those who eat eggs and dairy products) take B12 supplements to help them get the 2.6 micrograms daily needed during pregnancy. Dairy products are chock-full of these baby bone-building nutrients, but vegans will have to turn elsewhere to get the 1,000 milli- grams of calcium and 400 IU of vitamin D they need daily. "Vegans can eat dairy alternatives—like milk and yogurt made with soy and hemp—as well as orange juice," says Lara Field, M.S., R.D., a pediatric dietitian at the University of Chicago Celiac Disease Center and founder of Forming Early Eating Decisions (feed.com). "Read labels to make sure they're fortified with calcium and vitamin D." Seaweed, figs and collard greens are also good sources of calcium. Cold-water oily fish, such as salmon, are the main sources of these healthy fats, which enhance fetal brain and nervous system development. Good plant sources include algae, canola and flaxseed oils, walnuts and leafy green vegetables. The recommended dietary allowance (RDA) for pregnant women is 1.4 grams daily, but up to 3 grams of fish oil daily is probably safe. Supplements are also safe during pregnancy.